No it doesn’t. The ingredients list begins with “Bear meat, 90%” and then lists all the chemicals that make up the other 10%. Meat labeling laws are confusing to consumers, but I suspect that this packaging is perfectly legal though from a communications point of view it needs some work. 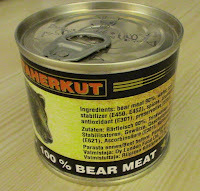 I think I understand what they mean: this can contains only the meat of bears and 90% of the content of the can is actual bear meat. This distinguishes it from those products where the meat is actually a cheap mixture of little bear and much more other animals that don’t need to be hunted one by one. It is also possible, though, that the strange inconsistency is the fault of food labeling laws, where the meat content can actually be more than 100% because the definition of meat content is roughly the meat content of the ingredients expressed as a percentage of the final product weight. A can of corned beef, for example, typically needs 120g of meat to make 100g of finished product. In this way it is 120% meat, but the rules say that when the meat percentage is more than 100% it should not be expressed that way, but it is possible to label as 100% meat something that actually has other ingredients. Of course you could also argue that it was better to leave the bear in the woods and eat something else but that’s another story.